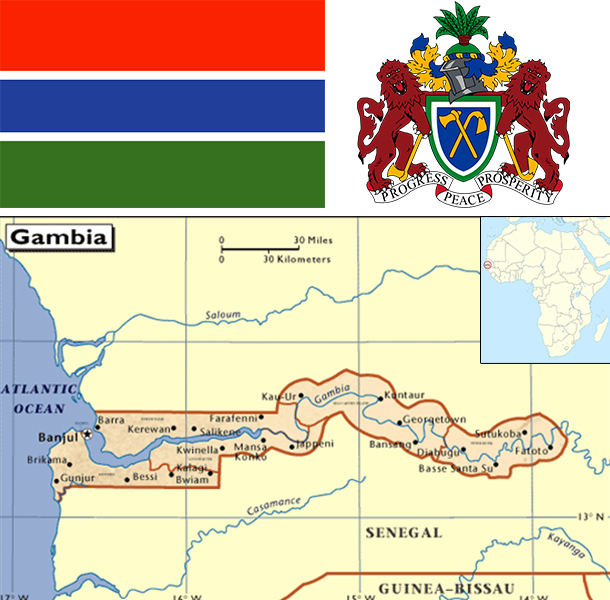 The Gambia gained its independence from the UK in 1965. Geographically surrounded by Senegal, it formed a short-lived Confederation of Senegambia between 1982 and 1989. In 1991 the two nations signed a friendship and cooperation treaty, but tensions have flared up intermittently since then. Yahya JAMMEH led a military coup in 1994 that overthrew the president and banned political activity. A new constitution and presidential election in 1996, followed by parliamentary balloting in 1997, completed a nominal return to civilian rule. JAMMEH was elected president in all subsequent elections including most recently in late 2011. The Gambia has sparse natural resource deposits and a limited agricultural base. It relies heavily on remittances from workers overseas and tourist receipts. Remittance inflows to The Gambia amount to about 20% of the country’s GDP. The government has invested strongly in the agriculture sector because three-quarters of the population depends on the sector for its livelihood and agriculture provides for about one-fifth of GDP. The agricultural sector has untapped potential - less than half of arable land is cultivated. Small-scale manufacturing activity features the processing of peanuts, fish, and hides. The Gambia's natural beauty and proximity to Europe has made it one of the larger tourist destinations in West Africa, boosted by government and private sector investments in eco-tourism and upscale facilities. Tourism normally brings in about one-fifth of GDP, but suffered in 2014 from tourists’ fears of Ebolavirus in neighboring West African countries. The Gambia's re-export trade accounts for almost 80% of goods exports and China was its largest trade partner for both exports and imports in 2013. In 2012 the IMF renewed an extended credit facility of $28.3 million for three years. Unemployment and underemployment remain high. Economic progress depends on sustained bilateral and multilateral aid, on responsible government economic management, and on continued technical assistance from multilateral and bilateral donors. International donors and lenders continue to be concerned about the quality of fiscal management. The Gambia's debt interest payments are projected to consume about 31% of government revenue in 2015. Relations with international donors have been tarnished by the country’s human rights record on homosexuality and human trafficking, perceptions of graft, and a declaration by the president in 2014 that the country would stop using English as the national language.